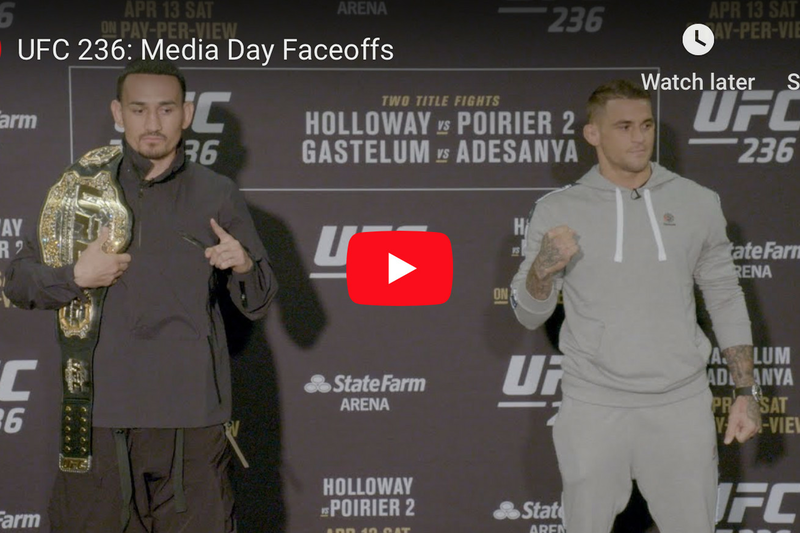 UFC featherweight king Max Holloway will try to become just the fourth fighter in UFC history to simultaneously hold two titles when he squares off with Dustin Poirier later tonight (Sat., April 13, 2019) at UFC 236 live on ESPN+ PPV from inside State Farm Arena in Atlanta, Georgia, for the interim lightweight title. It is a rematch over seven years in the making as “Diamond” defeated Holloway via submission back at UFC 143. 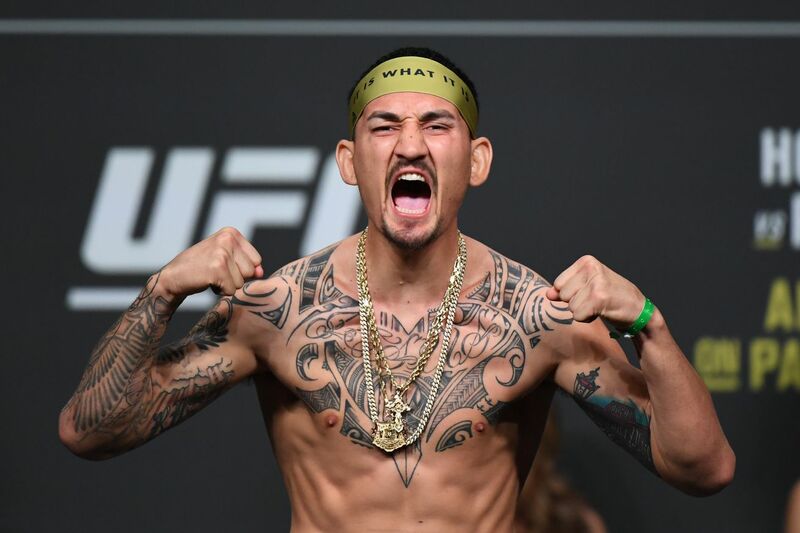 This is not only a huge opportunity for Holloway to headline UFC’s PPV debut on ESPN+, but it’s a chance for “Blessed” to prove that his long-storied success at featherweight can transition over to the 155-pound level. 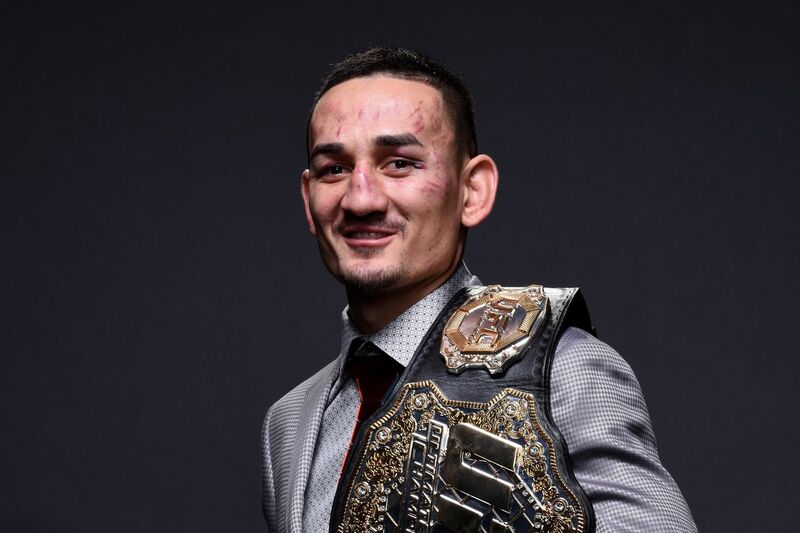 As the owner of a staggering 13-fight win streak, which is insanely impressive given the current talent at 145 pounds, Holloway is on the cusp of everlasting greatness. A win over Poirier should also line the Hawaiian up for a massive showdown with undefeated UFC lightweight champion Khabib Nurmagomedov. In advance to Holloway’s main event rematch with Poirier, the featherweight champion sat down with ESPN’s Brett Okamoto to take a look back at his Octagon journey throughout the years. Holloway not only breaks down his key wins over the likes of Jose Aldo and Brian Ortega, but he also discusses his first encounter with Poirier back in 2012 and his last recorded loss to Conor McGregor back in 2013. Check out the video above courtesy of ESPN. Only time will tell if Holloway can get his revenge on Poirier later tonight at UFC 236. If “Blessed” is able to win in convincing fashion and hoist two belts atop the cage in front of Atlanta’s finest it may finally be time to mention him among the best fighters to ever do it. MMAmania.com will deliver LIVE round-by-round, blow-by-blow coverage of the entire UFC 236 fight card, starting with the Fight Pass “Prelims” matches online, which are scheduled to begin at 6:15 p.m. ET, then the remaining undercard balance on ESPN at 8 p.m. ET, before the ESPN+ PPV main card start time at 10 p.m. ET. For more UFC 236 fight card news click here. Ultimate Fighting Championship (UFC) featherweight champion, Max Holloway, is all set to defend his 145-pound title against ex-lightweight kingpin Frankie Edgar in the UFC 222 pay-per-view (PPV) main event (details), locked and loaded for Sat., March 3, 2018 inside T-Mobile Arena in Las Vegas, Nevada. And he’ll do it as the -280 favorite (5/14). That’s according to our fiscal friends at Bovada, who opened Edgar at +225 (3/4). That’s not a far cry from their original betting line at UFC 218, a booking that was ultimately scrapped when the challenger was felled by a nasty eye injury. With “The Answer” fielding questions from this doubting Thomas, “Blessed” (19-3) went on to eliminate former champion Jose Aldo from the 145-pound title race, in what amounted to the Hawaiian’s twelfth straight win (and third straight finish). Edgar (22-5-1), meanwhile, has not competed since beating the brakes off Yair Rodriguez last May, one of two consecutive wins after the aforementioned Aldo (temporarily) bounced him from the featherweight title picture. So … these odds sound about right to you? Bellator 184: “Dantas vs. Caldwell” goes down at WinStar World Casino and Resort in Thackerville, Okla., this Friday night (Oct. 6, 2017), featuring a Spike TV-televised Bantamweight main event between division champion Eduardo Dantas (20-4) against “The Wolf” Darrion Caldwell (10-1). Former two-time Featherweight champion Daniel Straus (25-7) knows a lot about being in that position. Having defeated studs like Pat Curran and Patricio “Pitbull” Freire to claim the 145-pound crown, his biggest Kryptonite to date has been having rematches with the said same. In fact, his last fight with Freire was the fourth time the two had met. Having gone 1-3 in those four fights, Straus needs something extra special to put himself into yet another match with “Pitbull.” That opportunity starts with “El Matador” Emmanuel Sanchez (15-3), winner of five out of his last six, including former champion Marcos Galvao last time out. Normally, that’s where an interview like this would start, but Hurricane Irma disrupted many lives from the end of August to the middle of September. And Straus was no exception. And like so many other MMA veterans from South Florida, Straus was not going to give up everything he worked so hard for without a literal fight — Irma be damned. The same day I spoke to Straus the tragedy of the Las Vegas shooting unfolded, once again taking the hearts and minds of the fight community far away from the entertaining distraction of combat sports. It’s not an issue far from Straus’ heart. Gun violence has hurt him and the people closest to him in an immediate way that he was unable to talk about before his last fight with Freire. As difficult as it was to hear that Straus was hurting, I had to ask him if there was any correlation between the trauma he experienced and his performance in the fourth “Pitbull” fight. The fight with Sanchez this weekend takes on a whole new meaning now. It’s not just a fight to get back into contention, but a fight to show that Straus has regained his focus. Even though Sanchez might have a reach advantage (71” vs. 67”), Straus is not afraid of giving up the length to any opponent named “El Matador” or otherwise. If Straus can survive the tragedies of gun violence and natural disasters and come out stronger on the other side, there’s nothing Sanchez can say or do to phase him at all. 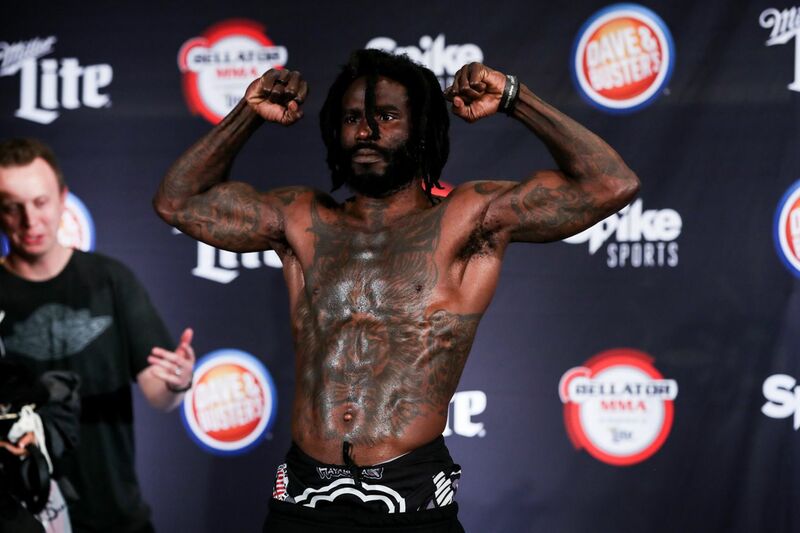 Daniel Straus is coming to Oklahoma this Friday night to start his career all over again at the expense of Emmanuel Sanchez. So don’t miss Bellator 184 at WinStar World Casino and Resort or on Spike TV. Complete audio of our interview is embedded above, and complete coverage of “Dantas vs. Caldwell” resides here at MMAmania.com all week long. The last man to vanquish all-time featherweight great Jose Aldo left the division without a single title defense to his credit. Don’t expect Max Holloway to follow suit.